HostRound LLC was founded in 2016 and is a web hosting company based in Delaware, USA. HostRound has 3 data centers, two in the US and one in the Netherlands, offering Dedicated Servers, VPS and shared web hosting packages. As well as providing hosting, they have an informative blog for those wanting to find out more about topics such as “The Differences Between Shared, VPS, and Dedicated Hosting”. On checking out their reviews we found them to have a lot of happy five-star customer reviews online, specifically when it comes to their WordPress Hosting and knowledgeable customer support. We feel that HostRound is a great solution for bloggers (especially in the US) as HostRound has become known for its hassle free WordPress Hosting. Their WP hosting offers 1-Click installation and super-fast page load times. When blogging, online data is everything, therefore HostRound’s free daily, weekly and monthly backup service is invaluable. If there was ever an issue with hacking or any other programming issue, customers can feel safe in the knowledge that their content can be retrieved, should that ever be required. For a young company (just 2 years young) HostRound has some great customer reviews online. Most of the customers are raving about how great the WordPress hosting is in particular. When using their servers for WordPress sites, customers report how fast their updates appear and that the pages load extremely quickly. They proudly focus on offering genuine 24/7 professional customer support. Their engineers are available around the clock to make sure that they do everything in their power to help customers succeed. The prices for hosting are quite competitive. After reading their reviews, customers seem very happy with the quality of service that they are getting for a relatively low price. HostRound states on their website that they have “Amazing Uptime” and that they have had 100% uptime in the past 6 months. This statement has not been challenged in any review, as clients consistently say that they are very impressed with the speed and stability of their websites that experience no downtime. Should your website ever be hacked, HostRound have you covered. They boast “Highly Secured Servers”, with enhanced firewall & mod security rules. They also employ other security tools like CXS that completely secure your site from hacks and suspicious files, as well as free DDoS mitigation. If all else fails (which is doubtable) they will have a backup so that you can reinstate your site in no time. All of the hosting is administered via cPanel, which is the leading industry control panel. Allowing easy customization of your websites. HostRound offers a full 30-day money back guarantee to gives peace of mind to new customers. This is available on their shared hosting and WordPress hosting packages and allows new customers to start their new website with ease, knowing that if they are not 100% happy then they can always get a full refund. You can now start any shared hosting plan for just $1.99 for the first 3 months. In addition to this, they offer new Dedicated Server customers free server management for the first month. The customer support with HostRound is brilliant. They offer around the clock live support via their online help desk as well as various points of contact for others to get in touch to discuss their services, such as billing and legal. We found a lot of customers who were very happy with the customer service provided with HostRound. In addition to this, we found the staff to be very approachable and friendly. There is no free domain name given with the “basic” shared hosting. This is often a great thing to provide new customers who don’t know much about hosting. This could prevent some people from entering the online market space due to not knowing much about hosting or domain names. Most of the servers on HostRound have a limit to how much traffic you can have on your website. This is however not a problem if you select one of their Unmetered Dedicated servers or VPS. Fully Managed Dedicated Servers – If you are looking for a Dedicated server to host a large project, or multiple smaller sites, then HostRound offer 15 different packages to suit all levels of developer. From their entry level Managed Dedicated Server Intel XeonE3-1270 V2, based in the Netherlands, to the Intel Xeon E3-1230 V6. With 8 of the Dedicated Hosting packages are being based in their European headquarters. 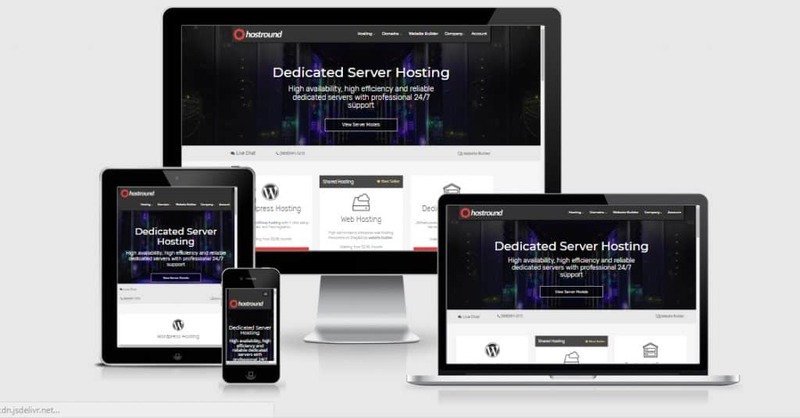 There are a lot of options to choose from, whether you are looking for a small, medium or large server based in the US or Europe, then there will be a fantastic solution available at HostRound. A fantastic host that provides a great selection of services for all levels of hosting requirements, with their own data centres located in three separate locations. HostRound is also a great hosting provider for those wishing to stream video content with powerful servers. We found them to offer great value for money and a fantastic range of services. If in doubt, they have a friendly team on hand to help you choose the best package to suit your individual needs.